How Has Stephen Hawking Survived for So Long With ALS? (Newser) – An ALS patient's life expectancy averages just two to five years after diagnosis, and only about 5% make it past 20 years, the ALS Association notes. But Stephen Hawking, the 73-year-old theoretical physicist and subject of an Academy Award-winning biopic, has beaten the odds and lived with his motor neuron disease for 52 years—and no one's sure why, though some experts suggest factors that may have increased his life span in today's Washington Post. Scientists also don't know for certain what causes ALS (aka Lou Gehrig's disease) in general and are studying genetic and environmental links, the CDC notes. 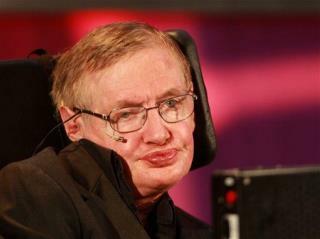 But although the underlying reasons for Hawking's long-term survival are unclear, researchers' thoughts on it aren't. "He is exceptional," neurology professor Nigel Leigh told the British Medical Journal in 2002. "I am not aware of anyone else who has survived with [ALS] as long." It's a shame that people don't know there is a cure for ALS. The cause is a buildup of free copper due to an atpb7 Wilson's disease gene defect. It is a mutation of Wilson's that doesn't affect the live. When people are born with this defect the buildup of free copper occurs in their blood stream, but their Blood Brain Barrier keeps it out of their brain. When they get older the BBB breaks down, becomes permeable and allows the free copper to enter the brain and short it out. The treatment is to get on copper chelating drugs such as TM and to take zinc, which blocks copper absorption in the gut and also gets copper out. Pipex researchers tested the free copper of ALS patients and found they all had high free copper. Get on a copper chelator and the disease can be reversed. You may have to relearn to speak and walk, but this disease can be reversed and cured, or successfully treated would be a better way to put it, because the genetic defect is still there. Because he's rich and famous enough to still have women give him a Big Bang every night. Well, when you are a rich-dude paid for with government grants from the taxpayers, YOU CAN GET ALL THE DRUGS YOU WANT, when, the average taxpayer cannot even get a 500 mg tab of Advil, with his/hers own after taxes money!